Black Hole Image Makes History. 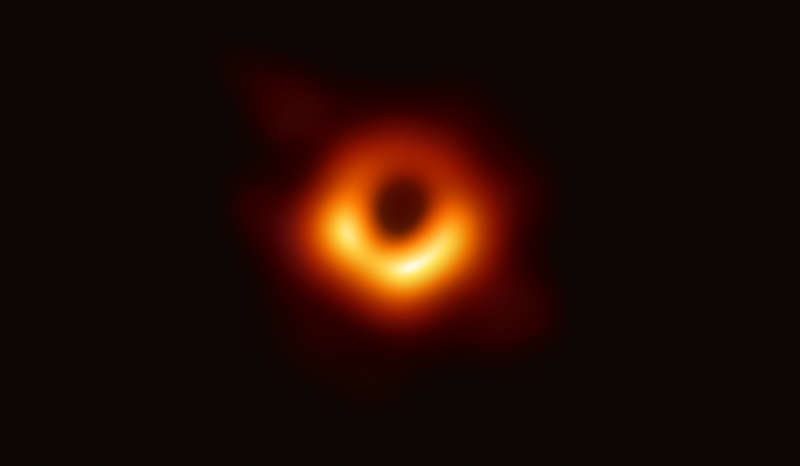 The European Commission is today revealing the first ever image of a black hole taken by Event Horizon Telescope, a global scientific collaboration involving EU-funded scientists. This major discovery provides visual evidence for the existence of black holes and pushes the boundaries of modern science. The first ever observation of a black hole is the result of the large scale international research collaboration Event Horizon Telescope (EHT), where EU-funded researchers have played a key role. This major scientific achievement marks a paradigm shift in our understanding of black holes, confirms the predictions of Albert Einstein‘s General Theory of Relativity and opens up new lines of enquiry into our universe. The first image of a black hole successfully captured was unveiled in six simultaneous press conferences across the globe today. “Fiction often inspires science, and black holes have long fuelled our dreams and curiosity. Today, thanks to the contribution of European scientists, the existence of black holes is no longer just a theoretical concept. This amazing discovery proves again how working together with partners around the world can lead to achieving the unthinkable and moving the horizons of our knowledge,” said Commissioner Carlos Moedas, responsible for Research, Science, and Innovation. “I congratulate the scientists across the globe who made this inspiring discovery and pushed the frontiers of our knowledge. I’m especially glad to see that scientists funded by the European Research Council contributed decisively to this breakthrough. The EU’s bold approach to funding such paradigm-shifting blue-sky research leads once more to a success story. It also further validates the ERC’s objective to fund high-risk/high-gain research,” added President of the European Research Council (ERC), Professor Jean-Pierre Bourguignon. EU funding through the European Research Council (ERC) has provided crucial support to the EHT. In particular, the EU has provided funding for three of the leading scientists and their teams involved in the discovery, as well as supported the development and upgrading of the large telescope infrastructure essential to the success of the project. Today’s results add to the many achievements of the EU’s research and innovation funding programmes Horizon 2020 and its predecessor Framework Programmes. Building on this success, the Commission has proposed Horizon Europe, the most ambitious EU programme yet to keep the EU at the forefront of global research and innovation. To allow the direct observation of a black hole’s immediate environment, the Event Horizon Telescope has sought to upgrade and connect a worldwide network of eight telescopes across the globe. These are located at challenging high-altitude sites, including in the Spanish Sierra Nevada, volcanoes in Hawaii and Mexico, mountains in Arizona, the Chilean Atacama Desert, and Antarctica. More than 200 researchers from Europe, Americas and East Asia are participating in this major international operation. The €14 million BlackHoleCam project which aims at capturing the image, measuring and understanding black holes. Since 2014, this six year research project is being carried out by three lead scientists and their teams; namely Professors Heino Falcke from Radboud University Nijmegen (also Chair of EHT Science Council), Michael Kramer from the Max Planck Institute for Radioastronomy, and Luciano Rezzolla from Goethe University Frankfurt. The RadioNet project supports a consortium of 27 institutions in Europe, the Republic of Korea and South Africa that aim to integrate world-class infrastructures for research in radio astronomy. This includes radio telescopes, telescope arrays, data archives and the globally operating European Network for Very Long Baseline Interferometry (EVN). The project is coordinated by the Max Planck Institute for Radioastronomy. In the past 15 years, the EU invested €30.3 million in RadioNet. The European Research Council, set up by the EU in 2007, is the premiere European funding organisation for excellent frontier research. Every year, it selects and funds the very best, creative researchers of any nationality and age, to run projects based in Europe. The ERC offers four core grant schemes: Starting, Consolidator, Advanced and Synergy Grants. With its additional Proof of Concept grant scheme, the ERC helps grantees to bridge the gap between grantees’ pioneering research and early phases of its commercialisation.